Avista's battery-powered speaker rentals are perfect for outdoor venues like parks, beaches and other place where finding power is a challenge. These speakers are complete sound systems, with wired microphone, speaker, and multiple input jacks for iPods, iPhones, etc. 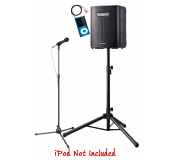 These speakers are perfect for wedding ceremonies and political events. Easy great sounding battery powered speaker great for wedding ceremonies. Runs on AA batteries!